The team reveal how the countryside is full of life even in the coldest of months. Steve Brown discovers the challenges faced by barn owls during winter. Matt heads to the man-made wilderness of the Norfolk Broads to witness one of the most ambitious wildlife projects the area has ever seen. The Broads Authority’s Dan Hoare guides Matt out onto the lakes of Hickling where new land is being created using the sludge from winter dredging. Once finished, a new two-and-a-half acre reed bed will help purify the surrounding waters and provide new habitat for birdlife. Steve Brown is in Devon on the lookout for barn owls. During the winter months, the mortality of these birds of prey peaks, driven largely by starvation. Around 70% of young fledglings die in their first year. As well a lack of food, weather, road hazards and loss of habitat are all contributing factors. 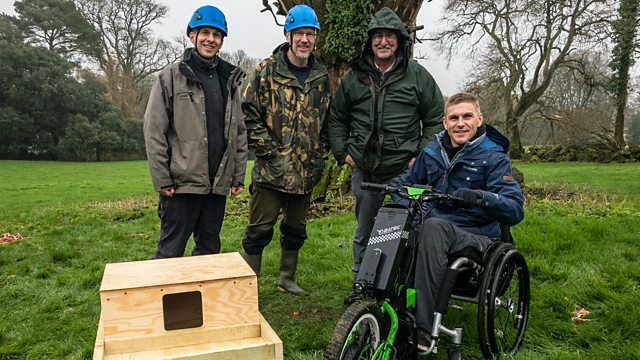 David Ramsden, from the Barn Owl Trust, shows Steve what makes the perfect nest box as part of a scheme to keep track of owl numbers and offer them a safe haven during the winter months. Kate Gater is a rural artist who lives in a small village in Cheshire. She's traditionally trained but chooses sound as her medium. In a modern world where we're all bombarded by strong visual imagery, Kate wants us to remember the art of listening. She goes out into the countryside in all weathers and seasons, armed with an array of recording equipment, to record natural sounds. She mixes these sounds to create “sound art pieces” which paint pictures of the seasons in the listener's mind. Winter is a time when wildlife often comes closet to humans - driven to our gardens and streets in the search for food. Matt meets ecologist Erica Murray to discover how the Broads Authority is capturing these seasonal sightings by lending wildlife cameras to locals and schools in East Anglia. The project is designed to capture a snapshot of the area’s animals and connect communities with the winter wildlife around them. Adam travels to St Mary’s on the Isles of Scilly where winter is harvest time for farmers. The islands specialise in scented narcissi and it's prime time for cutting the crop and shipping it back to the mainland. Adam meets narcissi farmer Andrew May to find out how the mild climate here sustains this winter crop - the largest industry on the islandswhen tourists are thin on the ground. John is in the Wiltshire village of Lover, which is nestled within the New Forest National Park. For a few weeks before Valentine’s Day, the village capitalises on its name, opening a pop-up post office to sell cards and handle post from romantics around the world. The money raised funds a preschool and local sporting events, which have breathed new life into this rural community. Continuing his journey around the Norfolk Broads, Matt meets Debra Nicholson, proud owner of Thurne Mill – one of the areas few operational drainage mills. For centuries farmers have battled the elements in this low-lying landscape. Their fields were often saved from winter flooding in years gone by thanks to these specially-designed windmills, which pumped the land dry. One of only a handful still fully functional, Thurne Mill is about to turn 200 years old and Matt lends a hand sprucing up the building for its big day.